Saturday Night Live has been in a bit of a rut as of late but a lot of that changed on last night's episode, hosted by Fifty Shades of Grey actress Dakota Johnson. 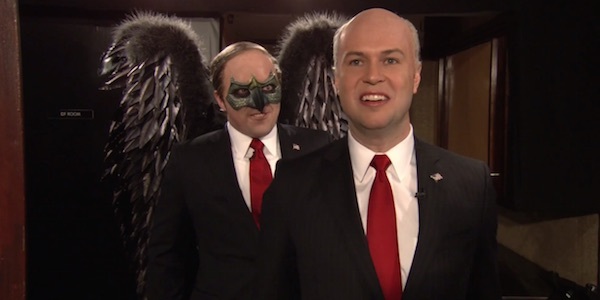 The cold open gave fans an amusing mashup featuring an interview with Taran Killam as former New York City Mayor Rudy Giuliani in the style of Academy Award Best Picture winner Birdman: Or (The Unexpected Virtue of Ignorance). Check it out below. Last night's cold open on NBC's SNL was absolutely hilarious. As seen above, Taran Killam definitely brought the laughs as Giuliani, (well, more as Michael Keaton pretending to be Giuliani). Speaking through his inner monologue (in the grumbly key of Birdman), he expressed frustrations and doubts about the current state of his career as opposed to his more popular days in the aftermath of 9/11. The skit began with The Real Story host Gretchen Carlson (Vanessa Bayer) kicking things off by reiterating Giuliani's comments that the President doesn't love America. It's when Killam's character's grisly inner voice kicks in, however, that the skit picked up some real steam. How did we end up here, in this dump? You were America's Mayor, remember? The funniest parts of the short came when Killam's Giuliani takes a moment to go for a walk to get his thoughts together. His expression when he runs into Bobby Moynihan (playing a mock version of the Zach Galifianakis character from the hit film) was spot on, as was his response when his daughter (played by Dakota Johnson in the vein of Emma Stone's Birdman character) calls his relevancy into question. The two of them played perfectly off of one another. While the somewhat lengthy skit ran for over four minutes, it never felt long, thanks to the spot-on comedic chops of Killam. His approach in the final moments of the backstage portion of the skit when he is confronted by his inner Birdman persona (played by Beck Bennett) was absolutely priceless. In watching his facial expressions you can see him run through at least ten different separate emotions in a matter of seconds. Watching Killam get back into Giuliani mode as he is handed the “emergency card,” allowing him to save the day once more, made for a very funny closing bit. Saturday Night Live recently celebrated its 40th Anniversary with a very entertaining special that saw the likes of Justin Timberlake, Paul McCartney, Kanye West, Bill Murray, Eddie Murphy and many more grace the stage. Catch episodes of SNL on Saturday nights at 11:30 EST on NBC.